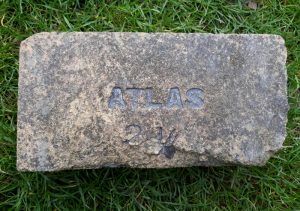 Atlas Brickworks, Bathville, Armadale, West Lothian. 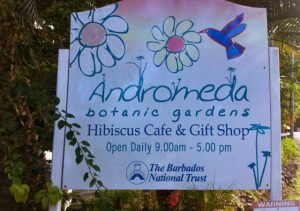 The following information and photographs have been supplied by Jack Whittles and Christa Stone from Nanaimo, British Columbia, Canada. 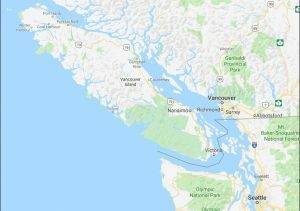 Jack states “Recently I have been collecting many bricks from a colliery site on Vancouver Island, British Columbia Canada. The Colliery was for the Cumberland Coal Mines that were in operation from about 1888 to 1961…. 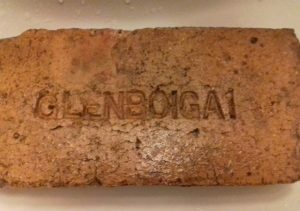 Found at the James Dougall, Bonnyside site, Bonnybridge. 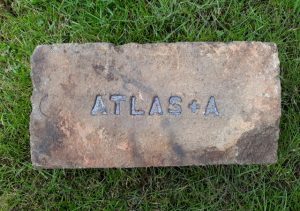 Atlas Brickworks, Bathville, Armadale, West Lothian. A large special. . . . . . . .
Found at Alloa. 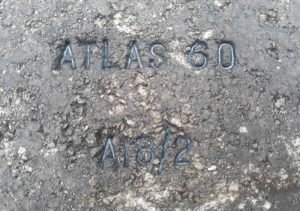 Atlas Brickworks, Bathville, Armadale, West Lothian. Although the lower edge of this stamp is broken, I am convinced it would read 2 1/4. . . . Below – The top edge of the stretcher is 2 1/4″ shorter than the bottom which may refer to the brickmark. Found at Alloa. 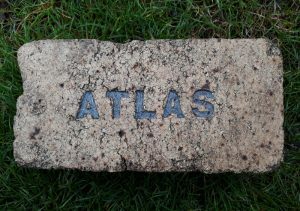 Atlas Brickworks, Bathville, Armadale, West Lothian. 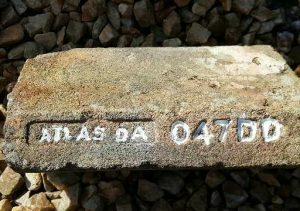 . . . .
Found by Gordon Wyle at the Manuel Works, Whitecross. 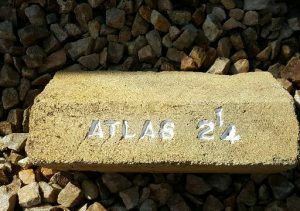 Atlas Brickworks, Bathville, Armadale, West Lothian . . . . 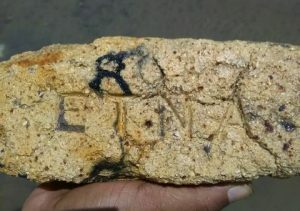 The following photos were kindly supplied by Tony Bedassie who found these bricks on a beach on Trinidad. Etna, Patent R.Brown Paisley, Gartcraig Patent Glasgow, Patent Wilson & Son Glasgow, Glenboig, Gartcosh, Allan & Man Govan Patent Glasgow, Atlas and possibly Coltness. Etna Brickworks, Armadale, West Lothian. 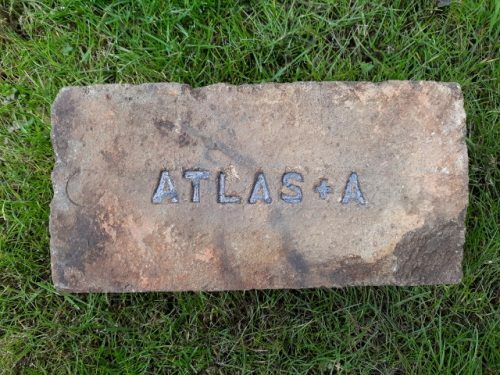 Alternative brickworks include: West Works, Armadale, West Lothian….